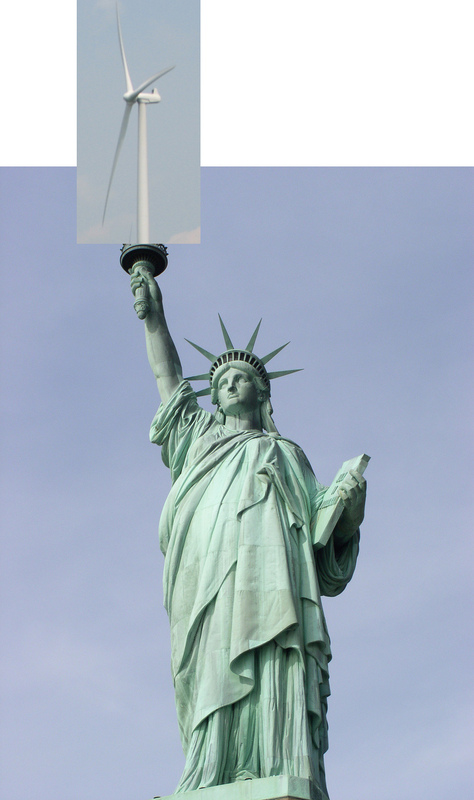 In a surprise move, New York Governor David Paterson and President Barack Obama announced plans to install a wind turbine at the site of the torch held by the Statue of Liberty. In a statement, President Obama said, “this enduring symbol of liberty will be reborn as a symbol not only of human freedom, but also of our independence from foreign sources of energy.” The announcement comes on the heels of the President’s decision to open swaths of the Atlantic and Alaskan coastlines to domestic oil drilling. More information on the announcement is here. Statute of Liberty with wind turbine. Artist's rendering. I love April Fool’s Day!